Back in March, I was blessed with a wonderful "Girls' Weekend" by my absolute best friend. She thought I needed a break before the baby made his arrival...and she was right!! 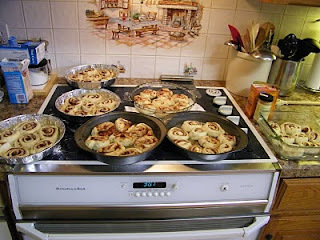 Christi also wanted to tackle the Pioneer Woman's Cinnamon Rolls. 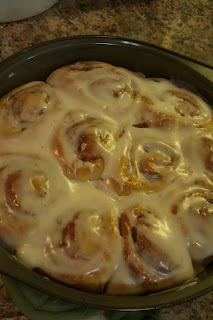 See, we had given each other the Pioneer Woman cookbook for Christmas, and these cinnamon rolls were tempting both of us. However, the recipe makes a very large batch, and well...Christi wanted some backup before tackling them by herself. We got to our house and plugged in Christi's ipod for some good baking music (think Death Cab for Cutie, etc). And then we set off to bake! When a recipe starts off with a quart of milk, cup of oil, and cup of sugar, you know it's going to make a lot of whatever it is you are baking!! For the Pioneer Woman's full recipe, along with an intense picture tutorial, click here. We pretty much followed the recipe, except I did have to add extra flour to get the dough to the right consistency, about one cup more. 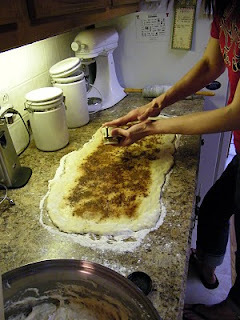 Also, we changed up the icing a bit, leaving out the coffee, and substituting vanilla extract for the maple flavoring. Use a little extra milk to get it to the right consistency if needed. The results of the experiment? Seven pans of yummy, buttery (very, very buttery!) 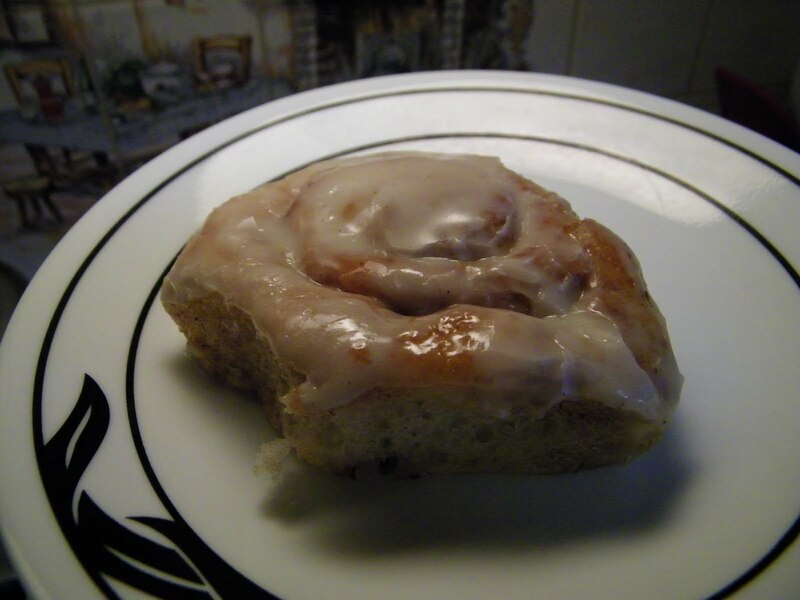 ooey, gooey cinnamon roll goodness!! We ate one pan right then and there. Okay, not just the two of us! My husband and kids did help out with that part! Christi took one pan with her, some we shared with friends, and I popped a couple of pans in the freezer for later. I can attest that they are just as good after a couple of months in the freezer as they are right out of the oven! D decided that he actually prefers them partially frozen (I froze the iced, cooled rolls right in the baking pan, covered tightly with foil). I like them cold. Or warmed up. Either way. Just let me eat them. That weekend was the BEST! Wow, that IS a lot of rolls! 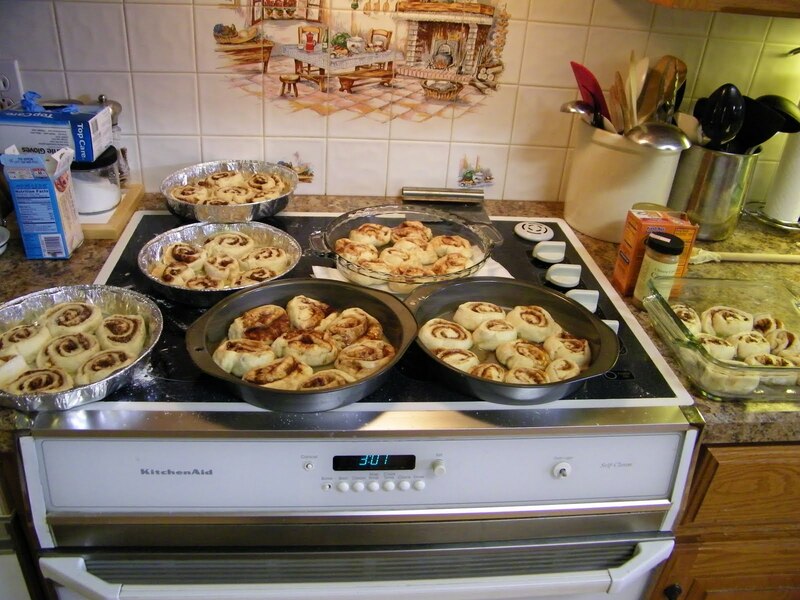 We love cinnamon rolls. I have a tried and true recipe, so I always have a hard time convincing myself to make Ree's. (I have her book, too, and am always enticed by those rolls!) I'll have to try them for sure. I've made her rolls and I was a little afraid of the maple flavoring because I didn't want it to be over powering...but it really wasn't. It was just perfect-o!